Map 1 of this blog is the Google Map around here. Around the summit we drive through the Rain Forest. They are very beautiful deep green forest. It is Hapu'u, kind of fern, looked like monster bracken. There are many forest with rich moisture like this in Hawaii, because States protect them as Forest Reserve. But they worried about wild pigs and goats which eat the fern and sprouts very much. But there is bigger power that destroys the wide rain forest in one night. That is.....! Yea! Lava flow. Suddenly The rain forest change such devastation. It is the start of Chain of Crater Road. There are 5 or 6 crater just beside this road. Crater is the hole that is made the vent exhausts lava, so the collapse occurs to the empty space. The big scale of crater are called Caldera, Kilauea Caldera is for example. The little hill of left side is Mauna Ulu, the dome made of tephra and lava. Once Mauna Ulu raged and erupted huge volume of lave. 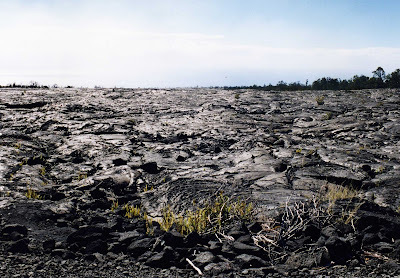 The source of wide lava field of previous photo was Mauna Ulu. The road continues still seeing Kipuka, little old forest they were not involved lava flow luckily,here and there.